According to Google's product manager of Chrome Mike Jazayeri, the company will be "focusing our investments in those technologies that are developed and licensed based on open web principles," at least when it comes to WebM VP8 and Theora video codecs Google released after acquiring On2 last year. That effort excludes support for the ISO's MPEG 4 H.264 codec, which is commercially licensed by its pool of patent holders. Google is apparently not exercising the same principles when it comes to supporting Adobe Flash, which unlike H.264, is completely proprietary to one company rather than being administered by a standards body. Last August, the MPEG Licensing Authority announced that it would indefinitely extend royalty-free Internet broadcasting licensing of its H.264 video codec to end users, erasing a key advantage of Google's WebM rival and cementing Apple's preferred H.264 as the video format for modern HTML5 video on the web. Google's blog indicates its announcement is intended to "give content publishers and developers using [HTML5 video tags] an opportunity to make any necessary changes to their sites," an apparent effort to force developers to support the WebM codec that has been largely ignored over the past year as content publishers have increasingly standardized upon H.264. The attraction of WebM is that it does not require licensing fees for use. However, critics claim that while the VP8 technology that WebM uses is not up to par with H.264, it very likely infringes patents held by the same vendors that have pooled their patents to create H.264. That means WebM will be hit with licensing demands if it ever does take off, erasing its sole benefit. Something similar happened to Microsoft's Windows Media Codec. Once it was openly published by the SMTPE under the name VC-1, it was found to be largely derived from MPEG standards, a revelation that limited Microsoft from substantially profiting from VC-1 royalties. Additionally, WebM is not supported by the hardware chipsets in mobile devices like smartphones and the iPad, which include H.264 hardware to speed video playback. This would force mobile devices to render WebM via software, which would offer poor performance less efficiently, causing a significant hit on battery life. Apple has rejected WebM as a standard that should replace H.264, in large part because it does nothing of benefit for Apple (to whom licensing fees are not an issue) while offering poorer performance and being incompatible with the company's installed base of tens of millions of iPods and iOS devices. Google has no users of existing devices to support, and can simply direct its existing Android users to buy new phones if WebM-capable hardware acceleration chips ever become available. The company does benefit from using free software however, as it allows it to distribute Android, its Chrome browser, and the forthcoming Chrome OS for free, without any licensing costs. That might change if Oracle's suit against Android over its unlicensed use of Java is upheld, and if MPEG partners demand licensing fees for patent infringements within WebM, leaving Google's enthusiasm for its free software less likely to be shared by other commercial entities, including content publishers and hardware makers. Immediately after posting its intent to remove bundled support for H.264 from Chrome, overwhelmingly negative responses were left by Google's Chromium blog readers. "Wow, this is the worst thing to happen to web standards I've seen in a long time. This just reinforces the notion that Google doesn't care about users," wrote Eridius. "Considering that the licensing restrictions surrounding use of H.264 were lifted by their license holder to allow ease of adoption on the web and that H.264 is the most popular Video Codec for HD since it is used on Blue-ray Discs and on all Apple Products, I would think this was a dumb idea. I understand being "open" but people slammed Mozilla for taking this stance with Firefox and it's support of H.264 so this just looks like a lame duck attempt by Google to promote their own Video Codec. Thanks for making the HTML5 Transition even more messy," wrote Kevin. "This is a move by Google where they care more about the open source "community" than they do actual users of their browser. Let's be real here: WebM has a LONG way to go before it will have any serious amount of traction, and Theora is a joke. Like it or now, h264 IS becoming the standard, and dropping support for it for no good reason is ridiculous. "Currently, in eyeshot, I have six devices that can all play digital video: a PS3, an Xbox 360, a laptop, an iMac, a PSP, and an iPhone. Guess what one codec each and every one of those devices is able to play? h264. If I want the widest audience possible to be able to access my content, why in the world would I encode it in either WebM or Theora? I wouldn't," wrote Shidoshi. "Are you going to not be bundling Flash now in your support of open standards? How two-faced," wrote Greg Brown. "How obnoxious! There's no large scale enterprise encoding tools for WebM. Some of us have rather a lot of video to encode. Thanks for breaking the browser I use, google. I'll be moving right back to safari as soon as this happens," wrote Nicoles. "As someone who has to manage (currently) about 150 GB worth of different videos across a plethora of websites, I wholeheartedly do NOT thank you for doing this. All you're doing is making me consider moving back to using Safari as my primary browser. I was just starting to like HTML5's video element, too... The problem is, WebM and Ogg are both extremely unsupported in everything except for FireFox, and now Chrome. Professional video software (Final Cut, Premiere, Avid, et all) doesn't support it (or support is flaky at best), and most video tools these days haven't a clue as to what a webm or oggv file is. This is a bad move, and will set the adoption of HTML5 video back even further. Definitely for me, and definitely for anyone besides YouTube, " wrote Jeff Geerling. "This is an utterly stupid move driven purely by corporate competition and not consumer convenience. Pushing WebM - an inferior and unsupported format - is all about an attempt to wrest control of the consumer video market from h.264 (and in many ways, Apple). h.264 is in use nearly everywhere - including your very own YouTube, Google.If anything, it's going to make publishers even more hostile toward Google and it's perceived control over their businesses," wrote John Federico. By removing support for H.264 from Chrome without any professional tools for WebM encoding in place, Google will likely only force its Chrome users to obtain and install H.264 playback codecs themselves, as Firefox users must already do. They may also switch to other browsers that can play H.264 video. Mozilla has already taken the position of refusing to license H.264 playback in Firefox. 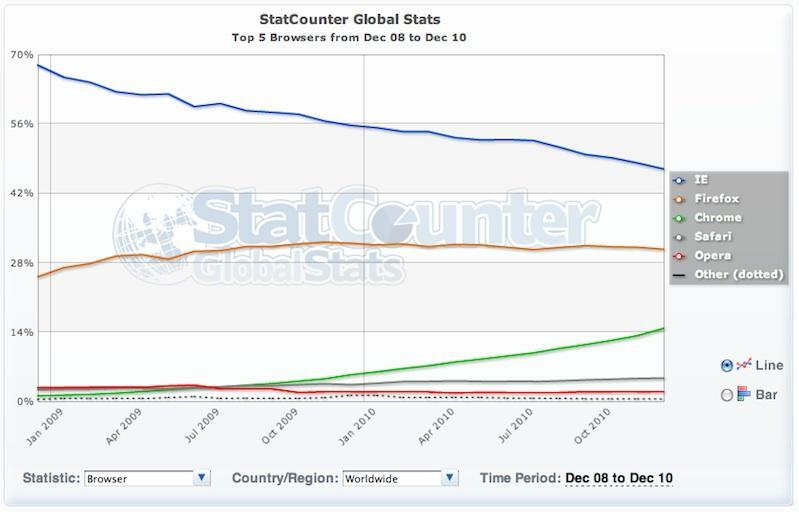 Over the last two years, Firefox market share growth has plateaued and remained flat since the fall of 2009, just as Google's Chrome began to grow rapidly (as indicated in StatCounter's Global Stats, below). Google's growth has come largely at the expense of Internet Explorer and growth of Firefox, with Safari slowly growing over the last two years. Mozilla's 30 percent of web users currently lack built-in support for H.264 playback, while more than 65 percent of the web uses Internet Explorer, Chrome or Safari, which do. With Google following Mozilla in ending support for H.264, users will either switch browsers or be unable to play the majority of videos that are not being served via Adobe Flash. Nearly all mobile smartphone browsers support H.264. If Google also removes H.264 support from Chrome within Android and the forthcoming Chrome OS, it may be enough to kill standards-based web video and send content producers back to Flash as a video distribution system. Ironically, Flash itself now uses H.264 as its internal codec within the Flash wrapper, meaning Google's push to quash H.264 can only possibly shift the world to using H.264, albeit wrapped in a Flash container that is not compatible with Apple's iOS devices. More likely however, it means users will simply adopt browsers that support common standards and that growth of Chrome will peak alongside the now stagnant share of Firefox.